‹ Chicken A La ? Tucked away in the hamlet of Preston Hollow, NY is a remarkable farm that features all things country, especially products of extraordinary quality from grass fed livestock. It’s a small journey from Woodstock and a delightful drive. A phone call to Carol Clement at 518-239-6234 and your order can be awaiting you at the Winter Saugerties Farmers’ Market. And it’s always as wonderful as can be. Here is a technique that insures that your Pork will not seize up during cooking. 1. Heat a cast iron grill pan to smoking. 2. Apply the seasonings & a TB of EVOO. 3. 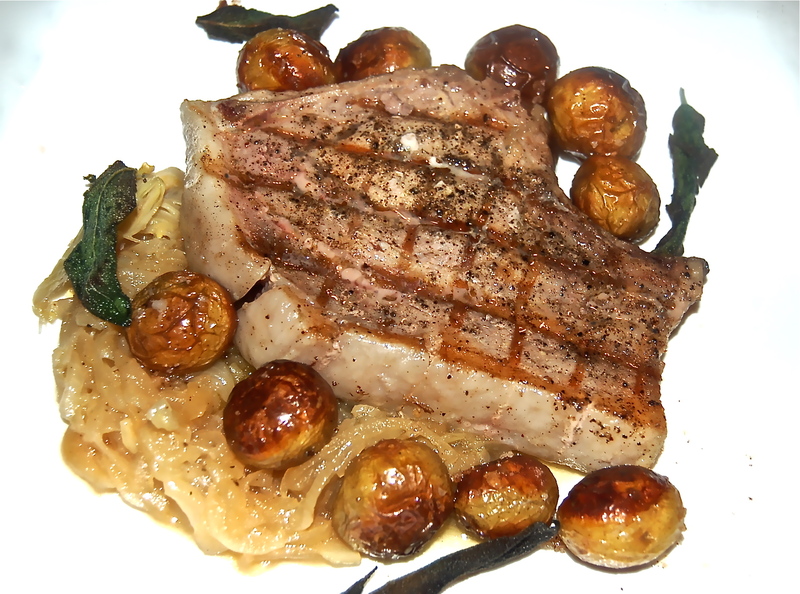 Sear the Pork Chops, weighted down with a grill press for 1 minute, turn both diagonally & repeated for another minute. Remove to a platter & tent with foil to keep warm. 4. In a deep sided saute pan add the second TB of EVOO. Add the Onions & Fennel & saute them until tender & lightly browned. 5. Return the Pork Chops to the pan. Add the Apple Juice, just enough to reach half way up the Chops. 6. Cover & braise the Chops for no more than 20 to 25 minutes. You really don’t want the Pork to be cooked beyond the rare to medium rare stage. Well done does only one thing to Pork, destroy it. 5. Spoon a generous portion of the Onion Fennel mixture on each plate. Top with a Pork Chop. Add the Oven roasted Baby Potatoes to flank the Pork Chops. 6. Finally, scatter the fried Sage leaves & serve.